Mayan Families is abuzz with excitement. Many changes have swept through our office in 2019, from new leadership roles of local staff, and the positive improvements we are beginning to implement throughout all of our departments. One of the most exciting developments in the organization has been the arrival of our new Executive Director, Erin Mooney. We can barely believe that she has been here one month already. To celebrate this first milestone, our Communications team sat down with Erin to gain insight into how her transition to rural Guatemala has been thus far; from her first few days working with our staff in a new office, to the path she seeks to help pave to a sustainable future for Mayan Families 2.0. MF: What has your transition to Panajachel and the Lake Atitlán region in general been like for you and your family? Erin: It's been wonderful. It's a lovely transition leaving Denver, where it was 23 degrees and arriving in Pana, always a sweet 75 degrees. My 16-year-old daughter is settling in, coming alive, and really excited to volunteer for Mayan Families. My husband has been practicing Spanish every day (which warms my heart), getting settled in and ready to follow his passion for water treatment, which is what originally brought us to Lake Atitlán 12 years ago. It's really exciting for all of us, we've been waiting for this for a long time. MF: Describe your first week in the office. What were some of the primary challenges and exciting tasks that you confronted? Erin: It was invigorating to get on the ground and see the impact and the potential of our work and programs. Our staff is incredible, and they have literally been working night and day through this transition, so finally being here and able to begin to support them in the way that they need and deserve feels like the right place to be. We have a whole lot to assess, to examine, and to begin to evolve in terms of our work, programs and organization, and at times the to-do list is daunting, but the passion and ability of staff and the stunning needs and knowledge of this community make those challenges ones that we are proud to dig into. I was incredibly impressed with the passion of the staff and knew instantly that this organization has incredible potential, with opportunities to hone and deepen our programming. For example, when I got here, the Education Department was in the process of delivering thousands of shoes, school supplies, and getting tuition payments paid; it was incredible to see a staff of seven do all of this (please stay tuned for links to your student photos through SmugMug-- each sponsor will receive a private link with photos from all activities this year in the next week!) . I am really inspired by our Trade School and Artisan Programs, recognizing that deeply-rooted poverty is what drives all of the need in our community. We have this incredible economic development program that provides parents with the skills and tools they need to change the whole trajectory of their families' economics. Supporting these programs more directly and focusing on growing them has incredible potential for changing economic opportunity around Lake Atitlán. It has also been really exciting to get on the ground and begin to work with our indigenous staff and communities. From day one I have had the distinct honor of meeting with the community leaders around the region, sitting down with parents and school directors to get our preschools open again, and beginning to partner with local indigenous leadership in a positive way. We want to ensure going forward that Mayan Families is not coming in with preconceived programming, but that we can continue to work with indigenous experts to meet need with community-driven solutions. We have the opportunity as an organization to be more collaborative with our community, which is surely going to lead to more sustainable work. 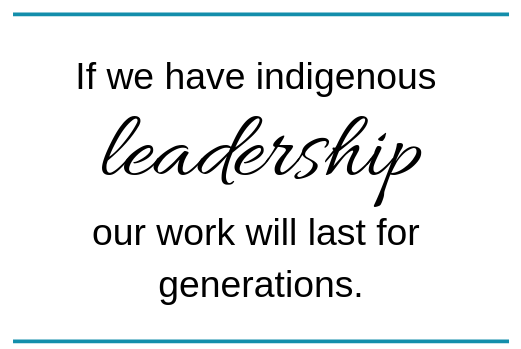 If we have indigenous leadership, our work will last for generations. MF: How has the Mayan Families staff welcomed you and what have you learned about each team? Erin: The welcome that I have received has been amazing and helped me feel that I am absolutely in the right place here at Mayan Families. The teams are tiny but mighty; it's incredible to see the amount of work that gets done with small teams, which are all led by indigenous staff. It's clear that the staff here was hungry for leadership, support, and ready for some long-needed changes. I am really excited to partner with our staff to figure out what is Mayan Families 2.0.; what are our values, what do we do and how do we work together to know that we are deepening the impact of our work day after day. I know this organization is going to thrive and I am honored to be a part of that future. Putting words into action, Erin leads the weekly staff meeting. MF: What are you most excited about for Mayan Families 2.0? Erin: I am most excited to move in the direction of building indigenous leadership, supporting our indigenous staff with the tools to manage this organization for the long haul, and to support our economic development work differently. I see this as being a primary key in shifting systems in our local communities. Job skills and opportunity for living wages are what enable families to live, thrive and be healthy within the Mayan land of Lake Atitlán. A big piece of what drove me here is my experience in working with first-generation immigrants in the states. I have seen through working in the field of trauma caused by migration, that many families who undergo such an experience have to leave so much behind in order to support their children. With the support that we need, Mayan Families 2.0 has the potential and ability to enable families to thrive in this community and a huge piece of that is our economic development programs. Another important piece for us is evolving our educational work and supporting children and families more deeply; not to just attend schools but to attend better schools. To support our students in developing leadership skills so that they may grow not just as individuals but as a community of educated indigenous students that will graduate from school with the skills to support each other to shift the way that resources are managed in the region. Myself, our staff members, and our community partners are thrilled to begin a community needs assessment over the next 6 to 9 months; so that we have the data, information, and partnership of community members that we will work with to complete this assessment to know what we need to do next as an organization to better meet the needs of community and assure that we have the deepest impact we can. I'm really excited with MF 2.0 to think strategically, to work with local leadership, to intentionally look at the data that exists--where are the best schools in the region, how can we get kids to these schools, where are the pockets of deeper poverty to make sure our resources are going to where they are needed most. To ensure that we aren't just giving shoes (shoes are important, absolutely) but shoes coupled with education, job skills, and long-term support, so we are holistically supporting families to rise up out of poverty, supporting them to further the power, knowledge, and sovereignty that is already embedded in Mayan communities. MF: What does MF 2.0 need as an organization to drive and support the mission of economic development? Erin: Mayan Families 2.0 absolutely needs support for our mission, to maintain and grow our beautiful educational, health, community and economic development work. unrestricted funding to stabilize the organization in order to allow for the ability to evaluate, to hire needed staff, and to grow our program staff so that we can quickly and efficiently respond to the needs of our community as well as the needs of our donors. It's not the cute stuff that donors love to fund, but we need funding for fundamental things to make our organization function more efficiently-- a new website and database (some of you may have noticed that neither work well and are "buggy" or "flawed" to say the least), computers for both staff and for the computer classes we offer, wi-fi routers for the office-- so unrestricted support helps us immensely, and allows us to do the cute stuff better and faster. More than anything, we need partnership for the long haul-- it's incredible to have volunteers, it's incredible to have hands on deck to build houses that need to be built, to paint preschools that need to be painted, to sponsor students. To that end we have about 400 unsponsored students right now so if anyone is willing to walk in partnership with us to give a child needed access education, it's an powerful and fulfilling way to help MF and the region. You can also sponsor Trade School students-- adults that want to attend our carpentry, welding, sewing or computer classes that don't necessarily have room in their budget or time because of other job commitments--sponsorships really help make that possible and can change the trajectory of that family's future. If you have questions or concerns, please reach out to us! We are working very hard with a reduced staff to meet massive community need and at the same time working on fixes within our communications systems (photos, automatic tax receipts, internet signal at the office, the database and website, and sometimes even electricity), so please know that we will get back to you but it may take a couple of days!